The Radium Course; Located on Top of the Hill, Offering Classic Mountain Golf for All Levels of Play. The Radium Course is an affordable, popular, and family friendly experience.A classic mountain golf experience offering enthralling vistas, exceptional course conditioning and highly memorable elevated tee boxes perfect for a selfie, #RadiumGolf. The Radium course is conveniently located in the Columbia Valley, just 5 minutes south of the Village of Radium Hot Springs on highway 93/95. Offering four sets of tees measuring from 5389 – 6269 yards along with new short tees for players of all abilities, this par 72 course can be forgiving to the average golfer, while offering up a challenge for the low handicapper. Cut out of the forest, this course features tight, tree-lined fairways, and undulating greens. 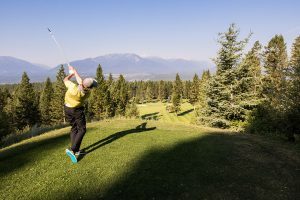 The Radium Course is truly in a one-of-a-kind setting, bordering Kootenay National Park, nestled in the Rocky Mountains and framed by the Purcell Mountains to the west. It’s easy to see why the oldest course in the Columbia Valley has withstood the test of time. The Radium Course offers the perfect venue for your meeting, event, team-building tournament, conference, golf group, wedding, family reunion, and more! Their experiences hospitality team will help you create an unforgettable experience, whatever the occasion.